We lack water here in Southern California. There are lots of things all of us can live without – water isn’t one of them. It’s getting worse. We’ll probably survive it; at least my generation will. I’m not so sure about our progeny. There are some consolations. This is one of them. It won’t quench our thirst, not for hydration anyway. It might serve to inspire us to find ways to pass it on to our grandchildren. For the ten months before I departed last year for points west I worked as a volunteer with Oldies But Goodies Cocker Spaniel Rescue, a wonderful group of people centered in and around the Greater Washington, DC area and completely devoted to rescuing animals that have, for a variety of reasons, lost their humans and then placing them through adoption into new ‘forever’ homes. As the name of the group implies, OBG focuses it attention on Cocker Spaniels. But it also handles quite a few ‘honorary’ Cockers. 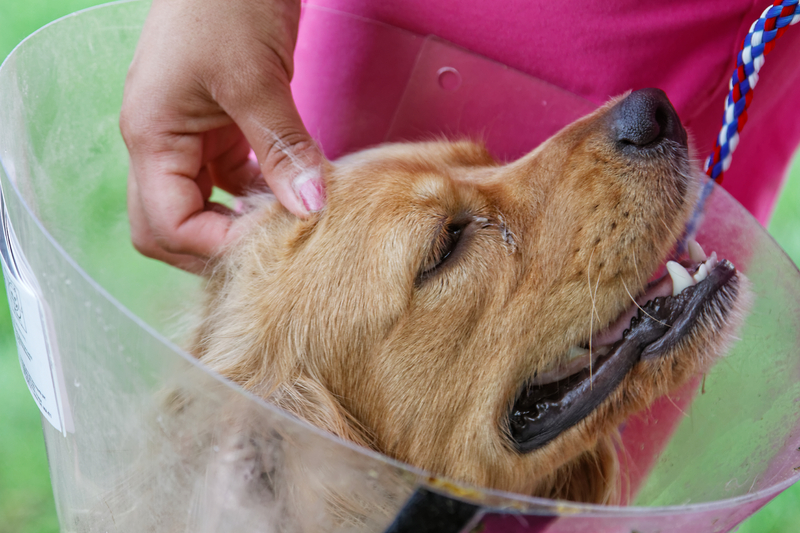 OBG is far from the only rescue organization operating in the DC area but it is certainly one of the more productive, placing in a good year as many as 150 dogs into new homes. Many of them retrieved from kill shelters where, had they not been adopted within 72 hours, faced almost certain death. These are domesticated animals bred specifically to serve as pets for humans. Pets are not toys that can, once their perceived value diminishes, be dumped on the nearest trash heap or passed on to charitable organizations. Or worse dropped at a kill shelter and three days later stuffed into a gas chamber. The yeoman work that OBG and its sister organizations around the country do to stem this tide is admirable but tides are, as you well know, unstoppable. No amount of work will ever be enough to save all these wonderful animals. Still, we try. There is no other way. We humans are all they have. It’s our responsibility, having bred them as our friends and servants and members of our family, to care for them lifelong. I really loved working with OBG and a couple of other rescue that operate in the area. I wasn’t torn by the years-long human relationships I was leaving behind when I hit the road. I’m not much of a personal, one-on-one type anyway so I knew that keeping in touch via social networks and the like would suffice for my purposes to maintain the connections. But in the few months I’d been a volunteer with OBG I had grown more than a little fond of the dogs whose care came my way. I fostered half a dozen and fell in love with one, YoYo. I transported dozens from shelters and vets facilities and specialized care offices and between foster homes and to weekend dog shows and at least one to a new (and hopefully) forever home. And I photographed them when I could, trying to get them to put there best face forward since many people initially select their new companions from our group and those like us on the basis of the images we place on the web. It’s not a beauty contest but it always helps to make a good first impression. Unfortunately I couldn’t continue with this service to the animals and fulfill my agenda, so I had to leave it behind. It hurt to do that. I know I was filling a big need, especially with the long haul transports that are difficult to find volunteers to support. I am happy that I did what I could while I was here. And it was great to get back just in time for the annual Cocker Cruise fundraiser and get to reunite with a ton of dogs and a half-dozen or more of my fav volunteer friends. Fundraisers require promotion. So I got the opportunity to engage with Clancy at Crosspointe Vet in Fairfax Station this morning to capture some images for a promotional campaign on his behalf. Another vol will fold these into a story and present them on the web through various channels. I think the goal is to raise the $4000 surgical and rehab fee. I have to say that when I walked into Crosspointe this morning I expected to find a despondent mutt whose head would need holding up for the camera. I mean, how would you feel after that experience? I could not have been further off the mark. His head did have to be held a bit – but only to slow him down for a shot. Clancy is one energetic dog who seemed to laugh at the apparatus attached to his leg to keep the bones in place while he heals. I found just looking at the thing painful but apparently Clancy is made of tougher material than I am. With help from Niza, the vet tech, we got some decent photos. It helped that Clancy is very photogenic. I also made an attempt at a video using the Canon 7D but cinematography really isn’t my game. I get another chance at that when Clancy goes for a post-op check up on the 20th. I think I’ll even get to try my hand at doing an interview with the vet. The better I do my part the greater the possibilities Clancy will find a new human to take care of soon. Humans are much more in need of this type of care than they either realize or perhaps are willing to admit. You might have noted by now that Clancy is also one our honorary Cocker Spaniels – well, he sort of has Cocker ears. He’s a mixed breed of some origin but I think you have to grant him handsome. A very happy animal begging for affection and yearning to return the favor. September 11 is a National Day of Service in US. I am so very pleased to have gotten the chance to fulfill the pledge. The Clancy video – uncut and unedited – may be viewed by clicking here. What follows requires a short explanation. It was originally written in 2012 as I was preparing to head west. I had rented my condo so was packing up personal effects to squirrel away in various basements around town. In the course of doing so I found a notebook of stories that my daughter AnnaSummer had written several years earlier. And for whatever reason I felt compelled to write a review of sorts. Or something. I’m packing again this year – for a very long trip – so I’ve pulled the stuff out of basements to take along. I’d forgotten this essay entirely. It’s about a lot of things – but mostly about AnnaSummer. There are parts of it that bring tears to my eyes when I read it. But in the end it’s a positive story and one I thought worth sharing. I was tempted to edit as I typed it in from my long-hand version – but I didn’t. It’s as it was written 12 months ago. It lacks structure. And I can think of a couple of folk who are not going to like what I’m saying. Whatever. Enjoy if you can. I just read this* again today for the first time since AnnaSummer presented it to me fourteen years ago. It’s a wonderful gift that I only today began to fully appreciate. I happened upon it while packing things up to leave on the longest road trip of my life. 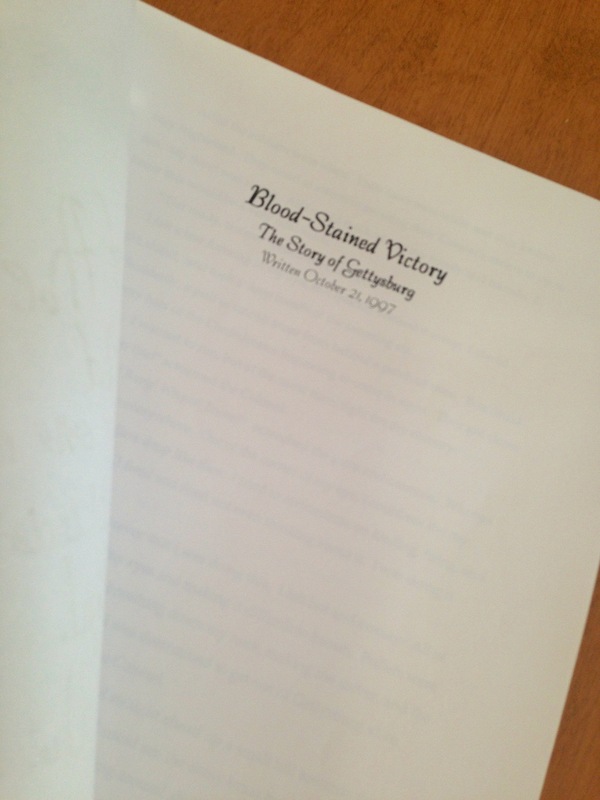 Three stories: The first, “Blood-Stained Victory – A Story of Gettysburg”, about fear, courage, sacrifice and the soul-shattering devastation of war. The second – an illustration of its title: “A Guilty Soul”. And the last, entitled “A Painting of America”, about family, hope, and letting go of the past to build a better future. It was easy to identify with each of these. I know firsthand the feelings associated with actions and the human residue of war. I’ve dodged the bullets, been spattered with the dirt and debris of close-by explosions, flown through the valleys of the deadly and the dying and carried the body bags containing the remains of friend and foe. The dead, no matter the reasons that led to their demise, are very neutral. They are also very heavy. And the more you carry, the heavier they become. The story of A Guilty Soul was more difficult to understand. The nature of the central character even more so. Why choose an Indian? Native Americans are known for many things but central among them is spirituality. Spirituality and guilt run counter to one another. So a guilt-ridden Indian is difficult – in my mind – to conjure. Perhaps not so much in the mind of a twelve year-old. Interestingly enough, if my newly discovered Louisiana relatives are correct, a twelve-year-old who carries at least a few drops of Choctaw blood in her veins. Hard to see however how AnnaSummer would fit the description of a squaw woman [Is that redundant?]. There was some fact (I’m not sure exactly what) that Anna did not include in her story of guilt. One day I might ask her if she remembers why and what it is. But I can imagine if she were sitting in a class and given a writing exercise and 30 minutes to illustrate some specified emotions, this could have been the result. The last story is the longest and I think the best. Anna, the main character and narrator, is well-developed. We learn quite a bit about her through dialogue and narrative. The relationship between her and her husband, Johann, is of especial interest. Anna: Young mother of one, housewife, painter and keeper of the family heirlooms. Artistic yet of conservative mind. Johann: Railroad Laborer whose vision transcends the horizon over which the tracks he’s laid course. A man who harbors dreams and takes actions to fulfill them. He’s buried stakes that secure the rails but he has also buried a stake under the kitchen floor that he hopes will secure his and his family’s future. He is enthusiastic – sometimes giddy – “Such a child” Anna humorously observes – but unwavering in his optimism. He’s generous. He shares his dream, literally and figuratively, with his family. Anna and Johann are both the sort of people you’d like to have over for coffee and Danish, or, perhaps in this case, beer and brats. They are also the sorts of people it took to build this country once they passed the entry gates at Ellis Island. They found no castles and built even fewer, but they became the backbone upon which we laid the foundation of our sovereign future. Their blood did not run at Lexington or Gettysburg but it covered the plains and the mountains coast to coast and nurtured the amber waves of grain of which we sing in all those patriotic events and football games we attend. 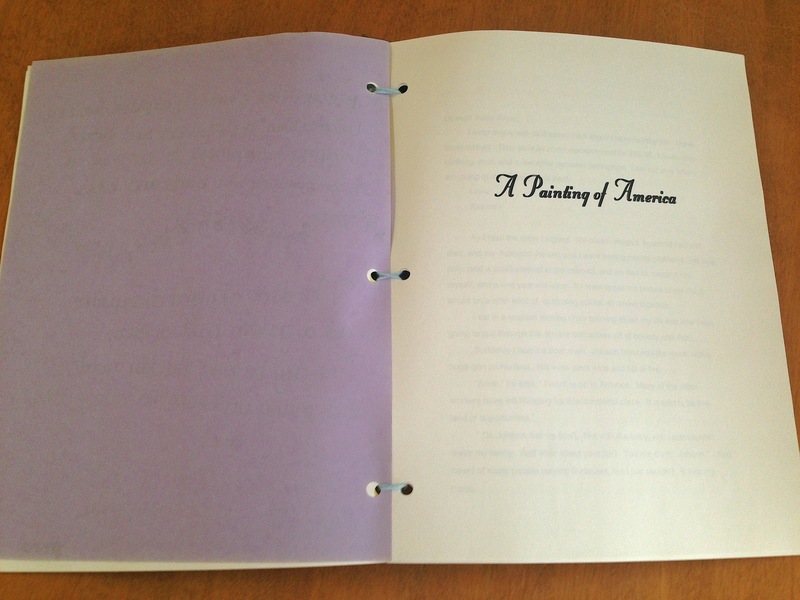 Anna’s chosen title for this story, “A Painting of America”, is very apropos. This story is also vaguely a story of Anna’s ancestry. Her great-grandmother was Hungarian and immigrated in the early 20th century. I can’t remember her name and I’m not sure I ever knew her husband’s name. Anna’s grandmother’s name was Ann, after whom she is named. Her grandfather was Frank, a Pole whose alcohol hazed personality was nowhere close to Johann’s – but then Anna never knew her grandfather – he died before she was born. He did contribute though. Grew up on the outskirts of Pittsburgh, PA. Served in the War. Worked in the mills. Literally built the house that he and Ann and their four girls grew up in. And then somewhere along the way the demons caught up with him. He tried fighting them with a bottle and got predictable results. I can identify with that. Anna’s story is one of hope and future. Frank’s was one of despair and past. While packing I was also reading through Ruth’s early compositions – her high school and college years – the ones she thought important enough or well done enough to save. But the first of all these is a ‘newspaper’’ she had written, edited and published when she was 10 years old. It’s entitled “Down the Scottsville Road”. It heralds life at the Crawford homestead as uniquely viewed through the eyes of its youngest resident. It’s also laid out like a newspaper. Inventive, to say the least. 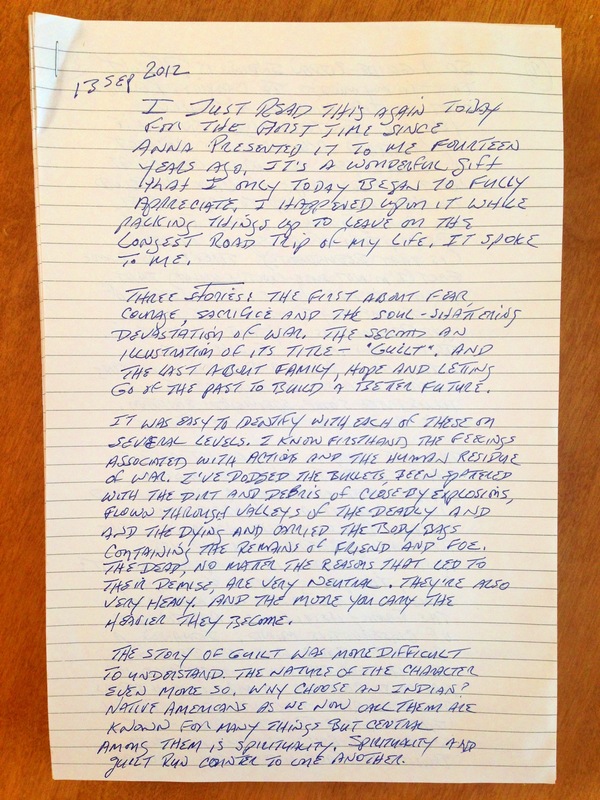 I’ve shared this with a number of people and I’ve now begun to share some of the later essays with Anna. Works that were produced in Ruth’s early 20’s. I’m so grateful to have both these talented women in my life. And for the writings they’ve created that I now have the opportunity to enjoy. In process I’ve discovered that my very own all-time favorite daughter is also a wonderful writer. I’ve probably known this; I’ve read her stories and poems before. But I’ve been so focused on Ruth and what I perceived to have lost in her passing that I’ve overlooked the future and what I (and the world) have gained through our children. I’m sitting here marveling at what I’ve just read. Just as Ruth’s stories stirred my heart I’m now near dumbstruck by the depth of emotion that flowed from Anna’s pen at the age of twelve. My wonder-girl. Now a wonder-woman. There’s a lot of talk these days – there always is – about whether the current generation is better or worse off than the one that produced it. These debates always center on economics – and maybe a smattering of morals. There’s nothing wrong with that and certainly it seems the economic challenges my children face are more dire than those faced by my generation. Having said that I have no fear that both Charles and AnnaSummer will do well with their lives economically – that they will always have everything they need and, to the extent it differs, a good deal of what they want. But I also think there are other measures of both success and progress. I was the first person in the family in which I grew up to attend college. It was not part of the plan I can assure you. (I have lately discovered that my Uncle Otho was the first in my ancestral family to have achieved this status.) But it was a foregone conclusion that both my children would attend university. Money was set-aside for this from the day they entered the world. By comparison my entry into this world was in doubt up to the second I emerged. When I was twelve I was well known by the local police and juvenile authorities. At that age my children were well known by their teachers and coaches and classmates – and well regarded. I entered the Army and went off to Vietnam at the age of 19 to escape the economic and intellectual poverty I had grown up with. Charles worked his way through one of this country’s finest academic institutions by among other things participating in Army ROTC and then going off to war as a matter of service to kin and country. Assisted by the GI Bill, I eventually took a degree in the liberal arts. My children took degrees in science (Nursing and engineering). I was married and divorced by age 25. My kids, now age 27 and 29, have yet to marry. Anna will however, exactly one year from today (next week in fact). Were it not for sheer luck and a lot of help from Ruth, who rescued me at age 49. I would be bankrupt today, wondering where my next meal would come from. Actually, that’s not true – I’d be dead. My children are conscious of their future, preparing for it now and living lives they are quite happy with. They are both contributing. The only imperative I have ever directed toward either of them is, no matter what, always be of service. They are. Like the Franks, real and fictional, the demons caught up with me and I fought them with bottles of every size, shape, color and content imaginable. I was losing badly until I was able to enlist Ruth’s assistance. 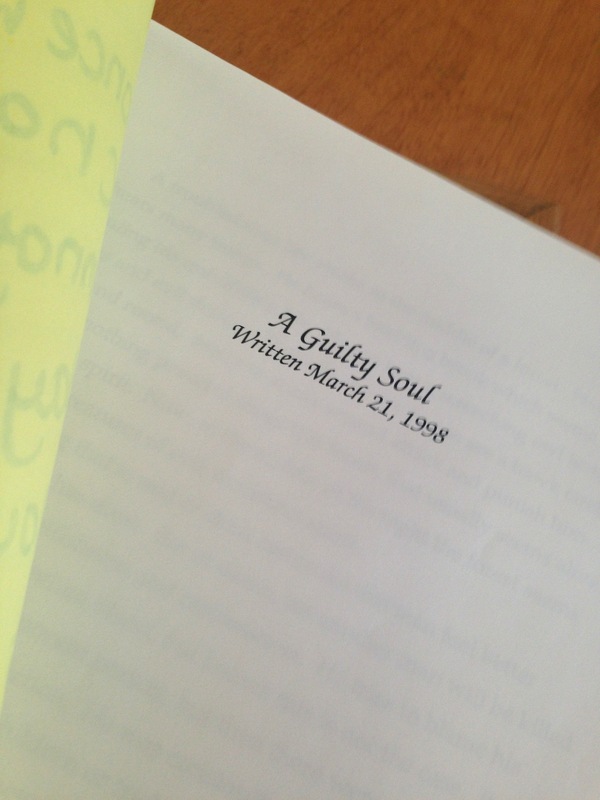 But 17 years later (18 now) I’m writing this. Both my children had their dance with the demons early on. Especially AnnaSummer. I think (I know) Ruth played a seminal role in saving her too. I’m confident that Anna will never return to that dance. Charles never spent a lot of time there. But he concerns me. I’m not sure he’s completely escaped the impact of the dysfunctional family his mother and I created or that of the two wars he participated in. Anna dove right into her profession. Charles is still searching. He seems to possess a passion for our natural heritage. I envy him sometimes. But I also wonder where this passion will take him. I wonder – but I do not worry. Long story short: There is a lot more to growth between the generations than the hubris-ridden robber barons ever had a clue about. I think my children – and a lot of my peer’s children – are onto that. They know things we don’t and perhaps never will. Anna’s early skills in creative writing and community service and Chaz’s in science and math and scouting have transformed them into the type of citizens this country dearly needs. They are not self-absorbed materialists. They are other oriented and I think upward bound. The challenges faced by each generation are different. Ours are not theirs. We have no right to judge them. We are blessed to observe their progress. 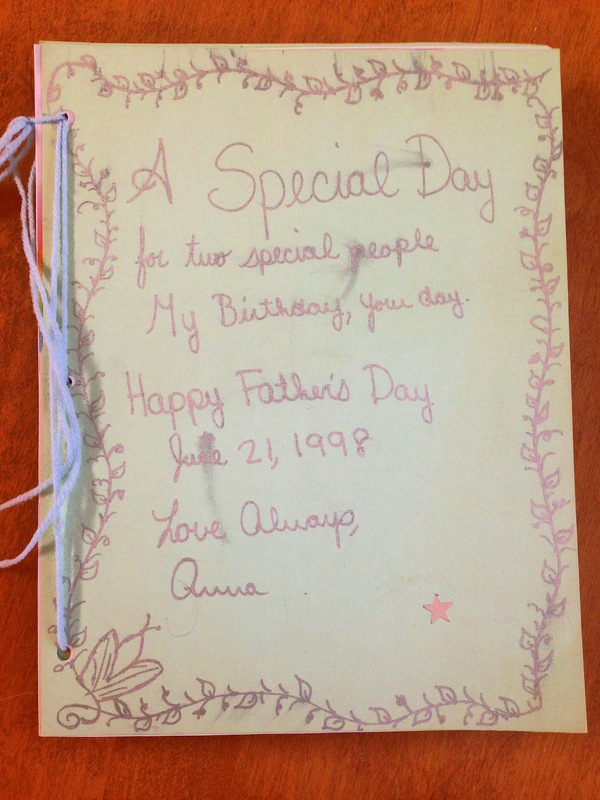 But I still marvel at the words my daughter put on paper at age twelve and was kind and generous and thoughtful enough to package up and present to me on Father’s Day 1998 and on the occasion of her thirteenth birthday. A delightful girl – most of the time. An admirable woman all the time. And my favorite daughter – forever. The first thing I want to say is I deliberately skipped posting yesterday. I’m well aware of the nature of the day and mean no disrespect but I didn’t think posting yet another flag or stone or plaque or whatever would add to the narrative. And I didn’t want to post non-related stuff so I simply stood down. But there is another reason too. On the day the attacks took place on our country eleven years ago, at the very hour of the attack in fact, Ruth and I were in the back of a London taxi on our way to Heathrow for our flight back to US. We’d had a long weekend in London celebrating our third wedding anniversary. As it turned out we were not able to leave UK for another week. But from that day forward the remembrance of the 9/11 attacks became inextricably intertwined with our anniversary celebration. That was a long time ago. Ruth as been gone now for more than five years and I suppose the truth is that I’ve grown accustomed to ignoring both the 11th and the 12th of September. The one only brings to mind the utter senselessness of the human race’s quest for control of things it will never, ever overcome. The other brings to mind the loss that punched a hole in my heart that has never entirely healed. But on this 12th September something different occurred. 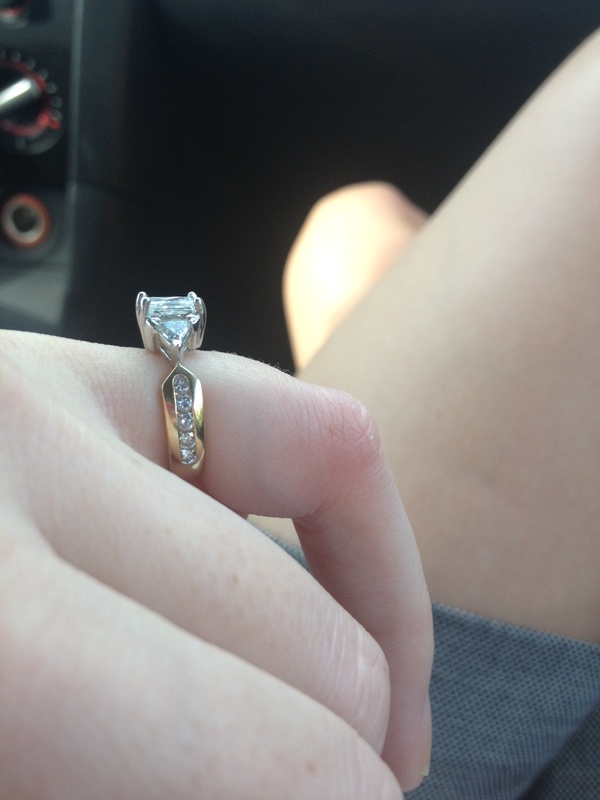 My daughter AnnaSummer, who is engaged to a wonderful young man named Massie, sent me a photograph of the ring she’d had fashioned from the wedding band and engagement ring that I had given Ruth fourteen years ago. I’d met with Massie in Charlottesville on the 17th August to pass these on to him while he was back from Austin on a visit with friends and family. In the eight years that he and AnnaSummer have been together I think this was the first time that the two of us had ever spent any private time together. I came away from that meeting knowing that my favorite daughter had made a good decision (as had Massie) and feeling very optimistic about their nuptials next September in Charlottesville. I also came away very pleased that AnnaSummer would have another connection to Ruth and that Ruth, wherever she is on her new assignment, would be looking on approvingly. The love between these two women was and is palpable and eternal. So todays picture, the 34th posted although not the 34th day, is of the ring as it exists now and will on the day Anna officially dons it. It’s accompanied by a picture of Ruth accepting the original from me on 12th September 1998. It’s an interesting design. 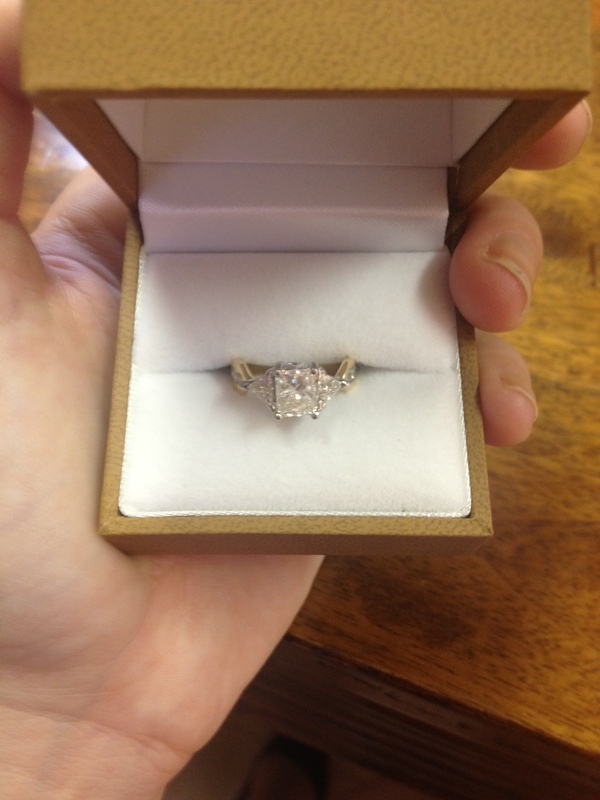 The wedding band and the engagement ring were not a matched set. but they were what Ruth wanted. The band is gold and has diamonds embedded over half its surface. 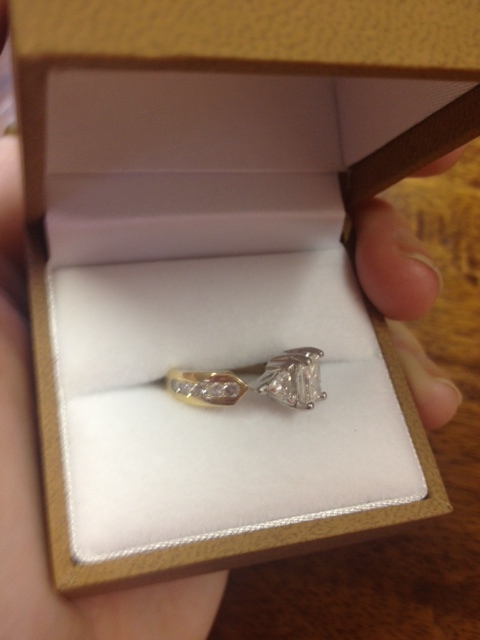 The engagement ring was more traditional with a three diamond array in a platinum setting. They do not physically sit well together. That was of no concern to Ruth who only wore the engagement ring with the band on special occasions. But AnnaSummer wanted to wear both rings together all the time and the fit was not working for her. So, she asked about modifying them to suit her approach and I thought it was a good way to make it both hers and Ruth’s. 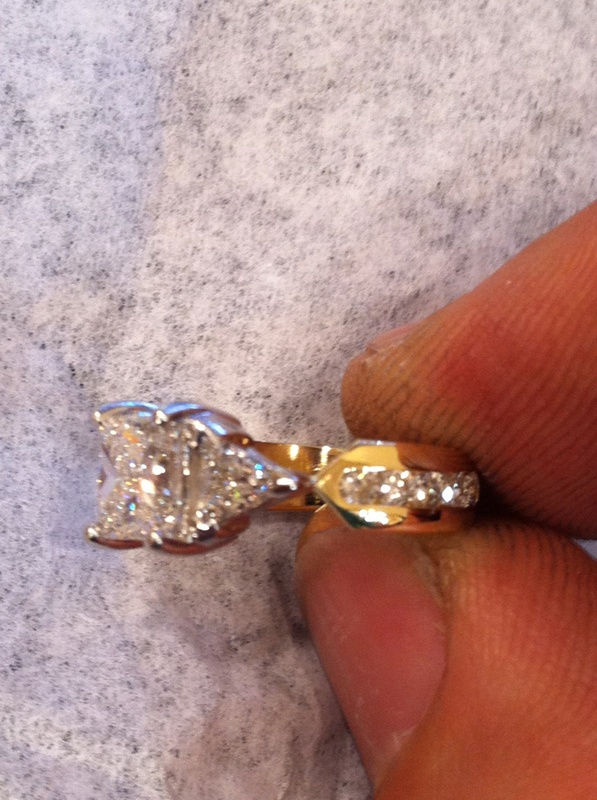 She consulted with her jeweler – yes, she has a jeweler; don’t ask – and they came up with the design amalgam you see here. I love it. I know Ruth would; she’s probably wondering: Why didn’t I think of that? Along with the picture of the new ring I had some other reminders today. I’ve packed up Ruth’s journals to store in our niece’s basement in preparation for a very long road trip I’m about to launch. And so I’ve read them again as I pack. Ruth was a prolific writer, a fact for which I will be forever grateful. But the journal I seemed to focus on today was the last one – the one that documented her feelings and activities in the last year. By this time all the shortcomings embodied in our relationship with one another over the years were set aside as we joined forces in the war against the cancer that was engulfing her tongue and throat and chest. So reading the account was not just reading Ruth’s story but our story. It was not easy then and folks it ain’t much easier now. My mother, who I never knew, died of cancer at the age of 47. Ruth, who as I look back on it now was the only other woman of import in my life up to that point, made it to 57. There’s something terribly wrong about this and I’ve been flooded with that thought all day. I got a short break with the Wednesday Spook Lunch group but then fell right back into the hole. Putting it down here in electronic ink is helping me climb out. And by tomorrow I hope to have dragged myself up and over the edge. The ring on Anna’s finger: past. present and future in platinum, gold and diamonds. No one loved is ever lost and Ruth was loved so much. Project 365 Day 24, a photo by RichardGHarrison on Flickr. YoYo departs for his forever home. A bittersweet moment. I’ve had YoYo as a foster cocker for the last six months working on his fear aggressiveness. In that period of time he progressed from the dog who bit me the first time I attempted to put a collar on him to one whose boundaries now know no limits. He’s the sixth Cocker Spaniel I’ve fostered this year for Oldies But Goodies Cocker Spaniel Rescue in the Greater Washington DC area and certainly the most memorable. I will miss his presence when I turn the light out tonight and when I roll out in the morning the scene will be a bit vacant lacking his smiling face and wagging stubby tail. He had been so poorly treated by whoever it was that owned him before he came to OBG. But we’ve done everything in our power to make up for that. I suspect he’ll never forget either circumstance but he is at heart a loving and loyal companion and I envy his new human family. He’ll be joining another rescue dog and three rescue cats in this next chapter in his life. I hope to run into him again at some future OBG family event. I give myself a day to grieve a little and then check back in to see what help I can provide to the new arrivals. And there will always be new arrivals – the need never ends. We’re all they have. Project 365 Day 21, a photo by RichardGHarrison on Flickr. Project 365 Day 17, a photo by RichardGHarrison on Flickr.